The push button interfaces UP 220/21 and UP 220/31 are binary input and output devices for installation in in-wall boxes (∅ 60 mm, depth: 40 mm). Each of the two (UP 220/21) resp. four (UP 220/31) channels may be used either as an input for potential-free switch / push button contacts or as an output for control of a light emitting diode (LED). The required scanning / control voltage is provided by the push button interface (requires no additional power supply). For example, up to 2 switches/push buttons with one potentialfree contact each or one 2-fold push button with two potentialfree contacts may be connected to a push button interface UP 220/21. Up to 4 switches/push buttons with one potential-free contact each or up to two 2-fold push buttons with two potential-free contacts each may be connected to a push button interface UP 220/31. The connection is carried out via a cable set which is permanently connected to the push button interface. 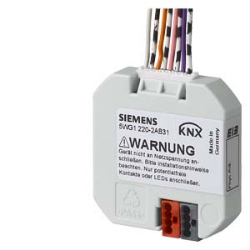 The connecting cables between switches/push buttons and the push button interface may be extended up to 10 m. It must be ensured that twisted cable pairs are used. Commands can be given to actuators via the connected switches/push buttons, e.g. for defined switching on/off, for dimming fluorescent lamps or for raising/lowering venetian blinds and adjusting the louvres. Each channel, which is configured as an output, can drive an output current of up to 2mA for controlling a light emitting diode (LED). With the ETS the application program is selected, its parameters and addresses are assigned appropriately, and downloaded to the push button interface UP 220/21 or UP 220/31. length: 280 mm unshielded, may be extended up to 10 m (per channel) with twisted, unshielded cable Unused free ends must be insulated!